ON THE COVER – We have two covers this month. 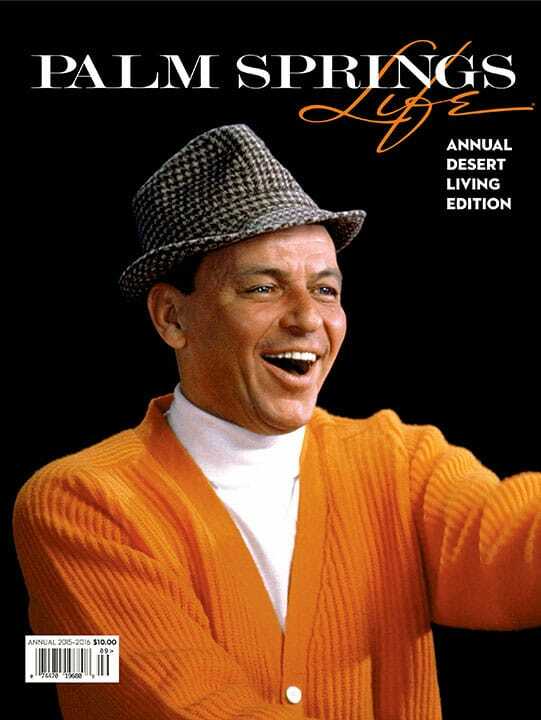 The Frank Sinatra cover was photographed by John Dominis/The LIFE Picture Collection/Getty Images. The swimsuit cover is courtesy of Trina Turk, 891 N Palm Canyon Drive, Palm Springs. Palm Springs was the sanctuary for Frank Sinatra during the ups and downs of his career, through marriages, divorces, and deaths. And it all happened within these walls. PGA Tour veteran and Big Horn resident Jim Colbert gives the skinny on his favorite valley holes. Cheryl Strayed’s novel has drawn many hikers to the adventure of a lifetime. Designing for the desert’s climate, architect Donald Wexler created an aesthetic that will last for generations. In a traveling exhibit of women’s shoes now at the Palm Springs Art Museum, this show asks an age old question: What does it mean to be well-heeled? In search of an oasis, they found a new horizon. This 38th edition of the Annual Desert Living issue celebrates the lives of some special valley residents and visitors. Onetime actor Billy Haines rose to become one of the biggest stars in Hollywood … it just wasn’t in front of a camera. Incorporating pieces from the past into a contemporary wardrobe breathes life into any closet. A new book exposes the naked truth of Einstein’s desert idylls. Sometimes driving in anger can make a person very happy. The Coachella Valley is known for its great produce. Why is it easier to buy grapes from Chile and tomatoes from Mexico? These 7 books are a must-have for any local, self-respecting coffee table. Sherryl Nova’s annual signs of the time. This selection of chic fashion and home décor will make you and your home want to look their best. World–class art in every imaginable medium draws admirers year-round from the valley and the world.